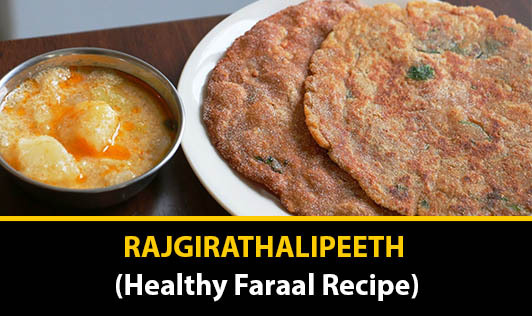 Make fasting healthy with this nutritious recipe. Replace your calorie rich sabudana khichdi with this traditional Maharashtrian recipe. Rich in proteins, this dish is not only nutritious but also tasty and filling. 1. Mash 1/3 cup of boiled potatoes in a bowl. 2. Add 1 cup rajgeera flour to it. 3. Add chopped green chillies, roasted peanut powder, jeera and salt to taste. 4. Knead it all together using little water to make firm dough. 5. Divide the dough into 4 equal parts. 6. Roll out into a thick roti using a little rajgeera flour or pat it on your palm with your fingers into thick rounds. 7. Heat a non-stick tava and cook them on both sides till golden brown. 8. Coat them with little ghee. 9. Serve hot with fresh curds or green chutney. Note: Avoid applying too much force while patting the thalipeeth to avoid breaking.